From 2002 to 2003, Mautner Project, the national lesbian health organization, conducted the first survey geared toward the African-American lesbian and bisexual community. The Susan G. Komen Foundation provided funds for this important research. Based on data from more than 600 participants, two former Mautner staffers — Deputy Director and Research Director Amari Sokoya Pearson-Fields, along with Spirit Health Education Project Coordinator and Systems Administrator Amikaeyla M. Proudfoot Gaston — founded S.H.E. 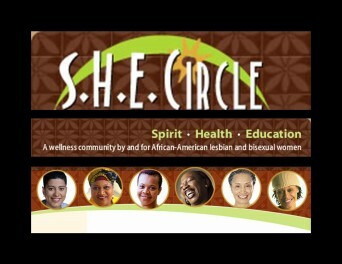 Circle, which combines the concepts of spirit, health, and education (S.H.E.). Now nine years old, S.H.E. Circle still focuses on African-American lesbians and bisexual women and accepts participants regardless of their socioeconomic status or with whom they are currently partnering. Two vibrant women are behind the program’s continued growth and community outreach. Associate of Educational Programs Riana Buford has been with Mautner Project for more than three years. D. Magrini is the Health Education Program Director and a Mautner staffer for more than seven years. Posted March 12th, 2013 & filed under Health.